Impact Recovery Systems | Garden State Highway Products, Inc.
Impact Recovery Systems are flexible, durable, high impact traffic control equipment for both permanent and temporary applications. Impact Recovery Systems provide road users with guidance devices through the night and during adverse climate conditions. A significant advantage of delineators in specific locations even when visibility is reduced and when there are several other vehicles present in the immediate area. 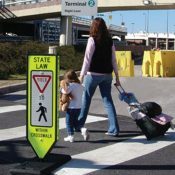 These flexible roadside markers/signs are tested for safety and durability to a variety of industry standards and government regulations. 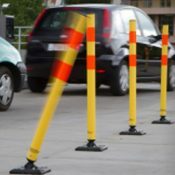 These roadside markers and/or delineators can be used on long continuous sections of highway or through short stretches of road where road construction work is taking place and where there are changes in horizontal alignment. Impact Recovery Systems flexible delineators are designed to aid motorists in identifying the alignment of the roadway when utilized in roadside or center-line applications. These flexible delineators are ideal for any application where high performance and durability are important, including exit lane delineation, changes in road alignment, center-line traffic separation or urban turn restrictions. 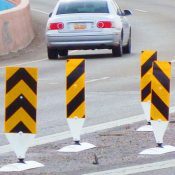 Delineators are manufactured to receive a 14” flattened area designed for the application of a 3”x12” area of retro-reflectivity on one or both sides and come standard with our patented reactive spring system that allows the posts to withstand multiple impacts and return to their original position without any vertical listing. Note: The color of the delineator should conform to adjacent pavement markings. A well-organized parking lot can mean the difference between traffic fluidity and traffic congestion. With Impact Recovery Systems’ full line of parking lot signs and safety systems, vehicles and pedestrians can move through the parking lot quickly, efficiently and most importantly, safely. These products are designed to give upon impact, then quickly return to their original position. The heart of our devices is our patented reactive spring system-making ours the only products on the market today that utilizes a mechanical device to increase product durability. Virtually every other flexible traffic control device relies on the memory of the plastic to provide its durability and performance. Use of the most durable sheeting on the market, as well as our quick release technology – that allows upright replacement in less than five seconds, stands us apart from the competition. These products are tested for safety and durability to a variety of industry standards and government regulations. Road crews and public safety officials use many kinds of traffic panels in today’s world. They serve a vital role in today’s rapidly changing infrastructure environment. 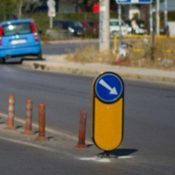 Some of the major types include hazard markers, object markers, k-markers sergeant stripes, vertical panels, chevron panels, lane dividers, temporary stop signs, portable sign stands and bike lane delineators.